Every spring at Osgoode Hall, 120 eager students show up for what professor Faisal Bhabha calls a “massive tryout process.” Spots are few, competition is fierce, and making the team—if you should be so lucky—is a big honour and a bigger commitment. “I’m essentially like a scout for a sports team,” says Faisal. Only he’s not talking about football; Faisal is the law school’s director of mooting. “Mooting is to lawyers what debating is to politicians,” explains Bhabha. “Moot” refers to a mock court case, complete with role players and costumes. “It’s a simulation exercise for law students that resembles, looks and feels like the real thing,” he says. Mooting is one of Osgoode’s oldest student clubs. What’s new, however, is the law school’s embrace of the ever-popular extracurricular into the school curriculum. 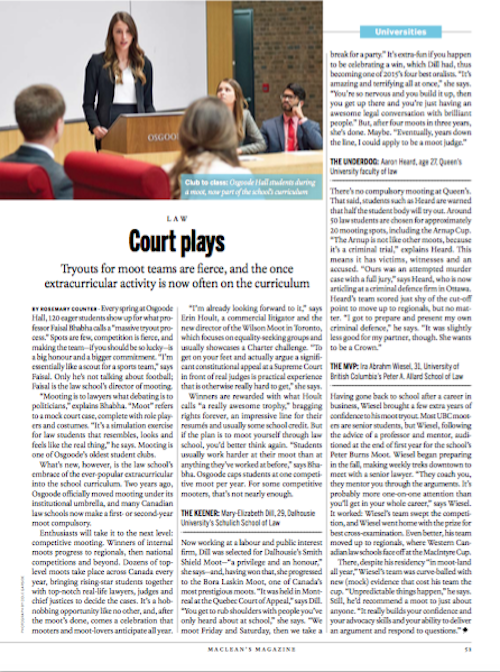 Two years ago, Osgoode officially moved mooting under its institutional umbrella, and many Canadian law schools now make a first- or second-year moot compulsory. Enthusiasts will take it to the next level: competitive mooting. Winners of internal moots progress to regionals, then national competitions and beyond. Dozens of top-level moots take place across Canada every year, bringing rising-star students together with top-notch real-life lawyers, judges and chief justices to decide the cases. It’s a hob-nobbing opportunity like no other, and, after the moot’s done, comes a celebration that mooters and moot-lovers anticipate all year. 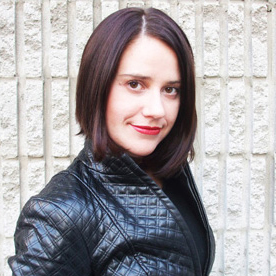 “I’m already looking forward to it,” says Erin Hoult, a commercial litigator and the new director of the Wilson Moot in Toronto, which focuses on equality-seeking groups and usually showcases a Charter challenge. “To get on your feet and actually argue a signifi- cant constitutional appeal at a Supreme Court in front of real judges is practical experience that is otherwise really hard to get,” she says. Winners are rewarded with what Hoult calls “a really awesome trophy,” bragging rights forever, an impressive line for their resumés and usually some school credit. But if the plan is to moot yourself through law school, you’d better think again. “Students usually work harder at their moot than at anything they’ve worked at before,” says Bhabha. Osgoode caps students at one competitive moot per year. For some competitive mooters, that’s not nearly enough.